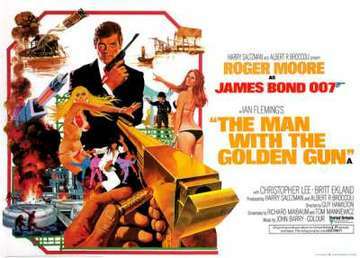 The Man with the Golden Gun (1974) is the ninth spy film in the James Bond series to be produced by Eon Productions, and the second to star Roger Moore as the fictional MI-6 agent James Bond. A loose adaptation of Ian Fleming's novel of the same name, the film has Bond sent after the Solex Agitator, a device that can harness the power of the sun, while facing the assassin Francisco Scaramanga, the "Man with the Golden Gun". The action culminates in a duel between them that settles the fate of the Solex.